Happy first day of fall! It’s always a little sad to mark the end of summer, but let’s be honest, fall fashion is way more fun! So many layers and textures and rich colors to play with is always a dream! 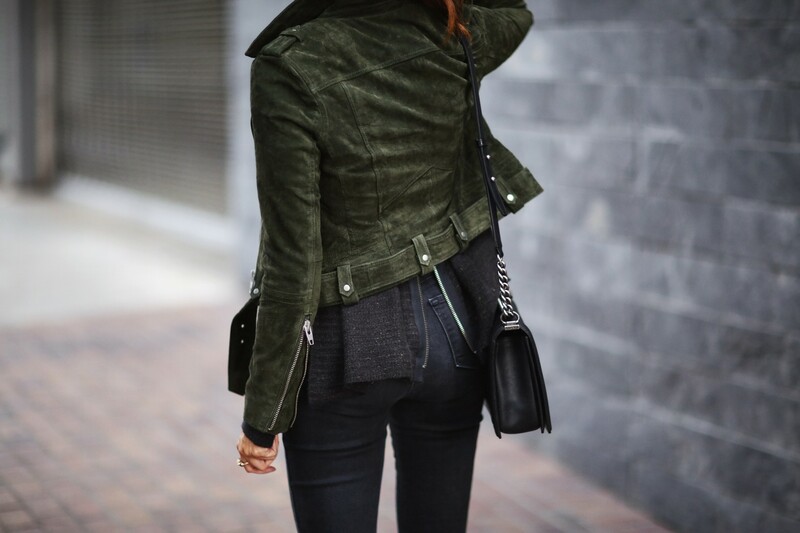 Speaking of rich colors and textures, this amazing green suede jacket is just the epitome of fall, to me. The soft suede and gorgeous silver hardware had me the second I set eyes on it AND the best part is that this jacket is under $200! (It also comes in a beautiful burgundy color). I honestly cannot believe how beautiful this jacket is for the price. If you are on the hunt for a suede jacket this fall I highly recommend trying this one from Nordstrom. Now here comes a little styling tip that makes you look longer and leaner…wear the same color head to toe. That’s exactly what I did for the rest of today’s look. I choose a dark grey palette for the lengthening effect, but any color works. The reason being is that horizontal color transitions are eliminated (Example, a light shirt paired with dark pants) so the eye flows freely up and down the outfit, which gives the illusion of being longer and learner. This is a styling trick I use often! Always like a piece with a fun twist! Show a little peek of skin or keep it totally zipped – its up to you! What size are you wearing in the jacket? Thanks! Love the sweater and the jacket! You look great! What size are you wearing in the sweater? Lovely as always! Absolutely a killer outfit! Your jacket is to die for! Your outfit is gorgeous!!!! I love the sweater! That jacket is so perfect for fall! The color is gorgeous! Yes! I’m in love with these jackets! Just loving the zipper back sweater too. So chic. I can’t get over that suede jacket! Love the color – and that sweater looks so stinkin cozy! Hi there! Do you remember the exact color name for this jacket? I just want to make sure I don’t get confused by any differing variations of green . Thanks in advance for any help!